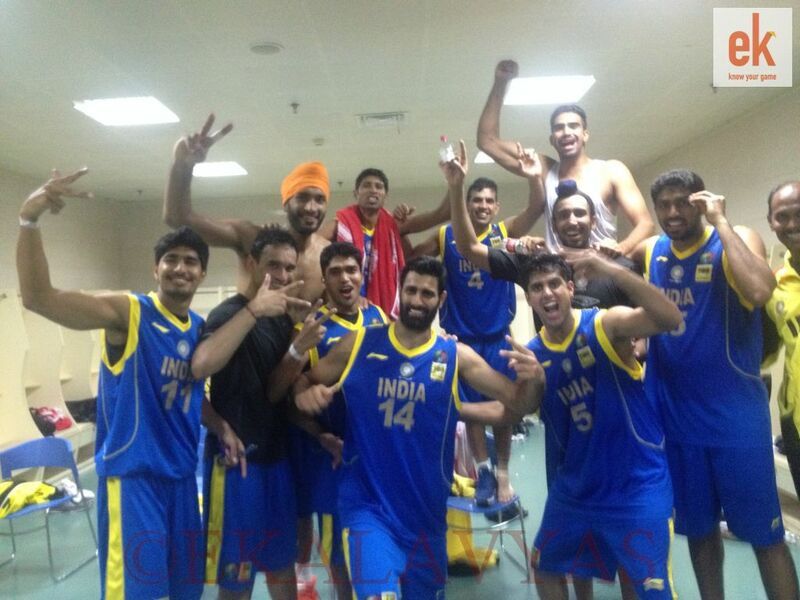 Indian National Men’s Basketball Team in the locker room after the historic win. Photo credits: Karan Madhok, Ekalavyas. Wuhan, China: Ladies and gentlemen, and all Hindustani hoop-heads from Kashmir to Kanyakumari. Lend me your ears, because history has been made! 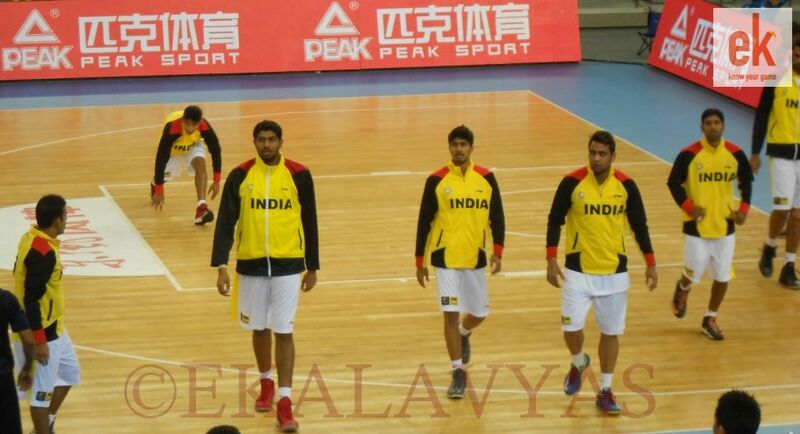 Indian Basketball history will always remember this day – July 13, 2014 – the day that they finally beat China. Head Coach Scott Flemming led India’s inspired 12-man squad to play their best game ever and lead India to a memorable 65-58 win, defeating China in front of their own home fans. India did a lot of things right to secure this historic win. They forced China to 23 turnovers. They defended every possession, and made it near impossible for China’s young prodigies such as Zhou Qi to operate in the inside. But for Flemming, India’s biggest advantage was how they closed the game – with China leading by two in the final quarter, India came back behind three clutch threes by Pratham Singh to take the lead, and then, even more improbably, they defended the lead till the very end. When the buzzer sounded, there were wild celebrations on the Indian bench. The impossible had been achieved, and this current crop of Indian players entered into the realms of hoops eternity. India were led by Amjyot Singh, who put in a masterful performance on both ends of the floor, and Pratham Singh, who was India’s hero in the fourth quarter with his clutch three-pointers. An alley-oop dunk by Amjyot gave India a five point lead in the dying minutes and ignited the away team to hysteria. From there on, India just had to keep their lead and sink their freethrows. India missed several easy chances to close the game off, but China did them many favours on the other end by reckless turnovers. India’s captain Vishesh Bhriguvanshi scored 10 points. China were led by Gao Shang and Zhou Qi, both of whom scored 12 points each. This is really an emotional moment for me. Indian Basketball is what ticks my life, my passion, and today, I feel proud to have been there in person to witness India’s biggest ever win in our 78-year history. Whatever happens from here, we will always remember this day, the day India dethroned China! A big thank you to all those who made this possible. Coach Scott Flemming. Amjyot Singh, Vishesh Bhriguvanshi, Amrit Pal Singh, Joginder Singh, Pratham Singh, Narendar Grewal, Prakash Mishra, Akilan Pari, Prasanna Sivakumar, Palpreet Singh Brar, Yadwinder Singh, Rikin Pethani, and our assistant coaches and medical staff. I’m happy for all those Indian basketball fans like me who get to live this moment. Now, let’s make history again so the next time, it isn’t as surprising! Years of tears, failure and being sidelined by other sports, Indian basketball is finally seeing some light. Let us truly hope and pray that our mainstream public wakes up to Indian basketball now. That parents allow their kids to pursue basketball by following the examples of our basketball heroes (like Amjyot Singh, Vishesh Bhriguvanshi, Pratham Singh, Narender Grewal, Joginder, Yadwinder, Riken, Amrit Pal, Prakash Mishra, Prasanna, Akilan, Palpreet and the countless others…) just like how they now tell their kids to idolise cricketers, badminton players or tennis stars. Many had put aside India’s win over Angola earlier this year as pure fluke, arguing fairly enough that Angola fielded its u-23 team. There were also arguments made that that win had come while India was playing in front of a home crowd in Goa. With this win over China in China, there can be no denying India’s moment in history. It’s hard not to get emotional right now. This is a triumph not just for the young Indian team, who has won despite insurmountable odds, but this is a victory for all those who have been tirelessly working to improve basketball over the last few decades. While India’s mainstream media and general public slumbers, our Young Cagers have done us all so proud! They beat 15th ranked Angola earlier this year at the Lusofonia Games in Goa, and now they have beaten 12th ranked China which is truly a global superpower of basketball. Let’s also not forget for a single moment that India achieved this win by beating China on their own turf in the face of a supremely hostile crowd. As our columnist Karan Madhok gets busy taking historic post game interviews (and hopefully a bunch of photos as well), we still try to catch over breaths over what just happened. Yes, India has beaten China in China. For Real. No kidding. This isnt an April Fool’s Joke. Wow..This is just unbelievable for words. This has to rank as one of India’s greatest ever international wins in basketball. To beat China in China has never been done before. This is a new dawn for Indian basketball. A mighty era has just begun, considering that most of the current Indian team are below the age of 25 years. INDIA WINS!!! INDIA WINS!!!! India defeat China by 7. What a HUGE HUGE victory. India 12 seconds and 7 points up from a historic win. Amjyot misses both. China airballs a three-pointer. India head to the free throw line again with Pratham Singh. China leads by 1 point now, 58-57 with just over 2 mins remaining for the final buzzer. Joginder Singh takes and misses a three. India are up 3 with 2:50 left. You can sense a real sense of nervous attention throughout everyone in this arena. Holy Mother Jesus! India leads 55-51 against China with 4:52 remaining. Will history be made tonight? India forces ANOTHER china turnover. 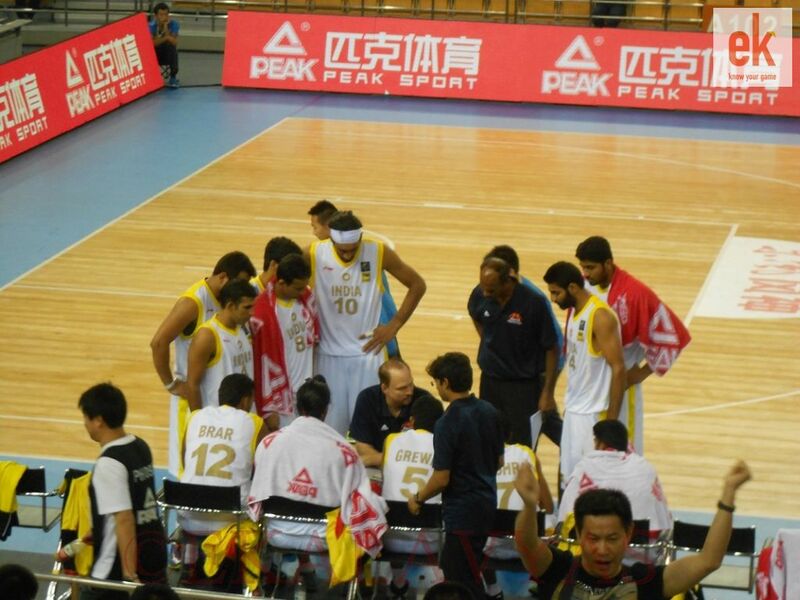 Amrit Pal misses from below the basket and the ball goes out of bounds, back to China. India up one with 5:37 left and China’s coach Huaiyu Wang calls a timeout. One more three by Pratham Singh, and India is now up four with less than 5 minutes to go! Pratham Singh is India’s Mr Cool. The IOB guard relishes stepping up with the game on the line. This young but highly experienced Indian team (average age of approx 25 years) has shown that it can handle pressure cooker situations. If ever there was a time for India to register its name in the history books, it is tonight. Beating China in China will be remembered for ages to come. But there’s still 6:48 mins remaining and India takes the lead 52-51! HUGE three by Pratham Singh and India takes the lead! The crowd, expecting an easy win for China, is stunned. Every squeak of a shoe-sole can be heard reverberating across the 13,000 seater arena. This is seriously nerve-wrecking stuff, even though neither side has scored a field goal in the final period. Zhou Qi wins an offensive board and is fouled. He heads to the line with China up 1. Turnover by China. India is down by one point with less than 8 minutes to go. Vishesh Bhriguvanshi is playing aggressively to start the fourth on both ends. This is a big game for our captain who has been India’s best male player for the last half a decade. Can he lead us to a memorable result? India is starting the fourth and final period with Rikin Pethani, Amjyot Singh, Narender Grewal, Vishesh Bhriguvanshi, and Pratham Singh. Apologies everybody, due to too much traffic there was a glitch in our third quarter commentary. China seems to have taken advantage of our glitch and have taken the lead. China leads 50-48 at the end of the third quarter. Ok India. One more quarter to do something an India team hasn’t’ done… since? I don’t even have the time to look up the history. But in a long time, surely. Can we beat China? India is up 33-31 at halftime. China haven’t overwhelmed, but they have slowly chipped away at India’s advantage. In the second quarter, India were outscored 20-9. Once again, turnovers are a problem for India, but the halftime buzzer coudn’t have come at a better time. Coach Scott Flemming at halftime will be talking to team about how to solve China’s sharpened defense now. This is a team that is used to beating India by 30, 40, or 50 points. And for India to be leading at halftime it’s huge. Unfortunately, it seems like the second quarter undid all the hard work of the first, and India will have to start from scratch all over again. Still, 20 minutes to go, and India have shown they have the ability to stare the Asian giants eye to eye. Can they make history today? Second half starts, and Tao Hanlin immediately finishes inside to tie the game at 33. Vishesh hits a three-pointer, and then Pratham Singh finishes a nice reverse layup, and India is up 5 again. Strong dunk by Tao Hanlin ignites the Chinese crowd. Hanlin Dong posts up to finish and earn a foul, China has come all the way back and now have teh lead. India need to box out more – China getting to many offensive rebounds. China is hustling back, through some good hustle steals and getting to the free throw line on the other end. India’s 12-point lead is now down to 5. Another timeout called by India. If you consider the statistics, interestingly, India has led in terms of points in the paint. India has 18 points around the basket against the Great Front Wall of China. Wonderful effort by India’s forwards & centres after their below par performance yesterday. Out of the timeout, Vishesh finds Yadwinder for an open outside jumper. But China’s Guo Shang comes back to hit a three, his second of the period. Zhou Qi attacks the basket and is fouled on the next possession, will shoot two. Good pass inside to Zhou Qi gets the big man an open dunk. The score is 30-21 to India with 2:52 left in the second quarter and India’s Coach Scott Flemming calls a timeout. Based on last year’s FIBA Asian Championship performance, the Indian team has been notorious in turning winning positions into losses after leading early on in the game. The Indian basketball team actually reminds us of our national cricket side from the 90s (when India was notorious for losing from what looked like easy wins!) So our Young Cagers need to ensure they can sustain this momentum in the second half against giants China. Good play coming off the inbounds as Rikin Pethani converts a two-pointer. Zhou Qi travels for China, and India gets possession again. China’s coach must be fuming about all these turnovers. China’s Gao Shang hits a three to make it a single digit game again. More turnovers by India, and more turnovers by China. Both teams playing carelessly. India lead by 10 with four minutes into the second quarter. China have sharpened up their defense considerably since the first quarter, and India aren’t any any more easy looks. But China can’t convert on the other end, either. Yadwinder steals the ball and gets the ball to Bhriguvanshi on the other end, who is fouled and shoots two, misse both. Rikin Pethani misses easy under the basket but converts his own rebound. Both teams unable to score in the last few possessions, no doubt due to turnovers: China’s young team seems under pressure playing at home, and the upstart Indians perhaps getting too excited at the fact that they lead by double digits! India’s super sub, Narender Grewal aka ‘The One Handed Shooter’ has been on fire. The Air Force Man has gone 3-4 from the field for his 6 points. India’s hard work on defense is turning to naught with a few careless turnovers on the offensive end. But China isn’t taking care of the ball either. Chinese fans chanting to try and inspire their young players. Amrit Pal Singh gets three blocks in the same defensive possession! And the shot clock expires, India gets the block back. Fantastic defense by both Amrit Pal and Amjyot Singh, but China gets a goal-tend call. India’s twin towers are playing the game of their lives. India’s point guard Joginder Singh is hurt in the eye. He is subbed out but it doesn’t look so serious so hopefully he’ll be back soon. Amjyot finishes again to start the 2nd quarter scoring. India now up 15! On the other end, Amrit Pal fouls to send Gao Shang to the line for two. The most shocking thing of the game so far isn’t the score; it’s the Chinese cheerleaders who came out in pink sarees and they a 2 minute Bollywood-inspired dance. Coach Scott has continued his trademark technique of rotating his players like a revolving door. India has already fielded 10 of its 12 players in the first quarter. Narender Grewal sinks another outside two, and China’s heave at the buzzer is no good. End of 1st quarter and India has a 24-11 lead. Phenomenal stuff on both ends by India – can they keep up this energy all game? India steals the ball again and Narender Grewal converts on the fast break to make it 22-11 for India. Offensive foul for China gives the ball back to India once more. Loved the effort Yadwinder Singh showed. He gets an appreciative pat from Coach Scott Flemming as he is replaced by Amrit Pal Singh. India turnover leads to easy points for Zhou Qi and China on the other end. A blocking foul on the offensive end by Rikin Pethani gives the ball back to China again. Go Yadu! He is after all India’s energy bar! That’s the name you coined for him didn’t you Hoopistani? China is playing a younger team, but they are still no slouch, as they beat Iran yesterday. Yadwinder Singh just blocked 7-foot-1 phenon Zhou Qi under the basket. Both teams seem to be over the team foul limit for the quarter, with close to three minutes still remaining. Bhriguvanshi misses a three but Yadwinder tips it in for two more points for India. China is having a hard time getting open looks, another miss for them. Impressive post move by Rikin Pethani to score two points off a fadeaway near the basket. On the other end, Yadwinder Singh forces Zhang Dayu of China to a miss. Narender Kumar with a beautiful dish to Yadwinder for two more easy points for India. India is up 15-8 and China calls a timeout. Joginder Singh fouled at the three point line. Fans in the arena are stunned silent so far. But Joginder misses 2 of 3 to give them some voice back. Amjyot just got called for his 2nd foul, which hurts because he has been the strongest player on both ends so far. He got subbed out for the experienced Yadwinder Singh. China’s Dong Hanlin misses one of two from the line. India up 10-5. Great play by Amjyot, who grabs and finishes the offensive board. India then force another turnover by China, offensive foul. India’s up 8-4 halfway in the first period. India are playing with a lot more determination. So much so that China subbed out their entire starting five just four minutes into the game. India bring in Rikin Pethani for Amrit Pal Singh. Rikin posts up and misses. Once again, India start strong on the defensive end. After a Zhou Qi two, Amjyot Singh hits a 3 and Vishesh sinks three free throws to give India a 6-2 early lead. To answer your question Gopal, China is taller, but also more athletic. They might be slightly slower than Japan, but both teams are much faster than India. I have no doubt that India will cut down on turnovers, but they might suffer on other parts of the game, such as finishing in the post or grabbing rebounds. National anthems over. Now we’re just seconds from tip-off! Hi Karan! Hope Wuhan is treating you well. It’s an interesting point you make about India needing to cut down on turnovers tonight. No doubt, China will be a tougher opponent than yesterday’s Japan, but at the same time, do you think it is possible that China’s tall frontline might actually work to India’s advantage with respect to fewer turnovers? Because from what I recall from your comments yesterday, Japan’s faster game was the cause of many of India’s TOs. So perhaps, China playing a taller/slower game might actually work to India’s advantage as both teams will play at the same pace. What are your thoughts on this? This being a primetime affair, there’s a lot of fanfare before the game. Cheerleaders, fans dancing on the bleachers, and loud MCs. India lost yesterday’s game to Japan and will be facing an uphill task today. The onus will be on the likes of Amrit Pal Singh and Amjyot Singh to prevent China’s Tao Hanlin or Gao Shang from getting easy looks inside. Offensively, India will have to cut down on the turnovers that plagued them terribly against Japan yesterday, which is much easier said than done considering the favoured opponents tonight. This will be China’s third game in the competition, and they are 2-0 so far, defeating Indonesia by 68 points and then posting an impressive 13 point win over title challengers Iran yesterday. The player to watch for China is their 7-foot-1 Center Zhou Qi. Zhou is an 18-year-old rising star and predicted by many to be the future of Chinese basketball. If he can continue to develop at a strong pace, he could be a future NBA draft pick. Iran-Indonesia game is over. China vs. India set to begin in about 40 minutes. Some of the Indian players are already out doing their pre-game shootaround. Correction: India plays against Indonesia tomorrow (Monday) and then have their final Preliminary Round game against Iran on Tuesday. Before the India game, Iran is playing Indonesia. India plays Iran tomorrow and Indonesia the day after. Indonesia are ranked several spots before India in the FIBA World Rankings and thus are India’s most realistic option of getting a Preliminary Round win and moving on to the Quarter-Finals. Like India, they also lost their first and only game, which was to China. And… we’re back! We’re less than 3 hours away from India’s second game at the 5th FIBA Asia Cup against China, which will tip off at 5 PM India time. Make sure to catch my live play by play commentary. I’m here early at the Wuhan Sports Center in Wuhan, China, and India will have to contend against what is expected to be a huge home crowd. And of course, we’re playing one of the tournament’s favourites and the home team, China. Yesterday, China defeated Iran in the night’s primetime game. Iran were the winners of last year’s FIBA ABC in Manila and 2012 FIBA Asia Cup in Tokyo, so it was a big deal for China to finally overcome their top Asian rivals. This is a younger Chinese team which hopes to return back to the top in the continent. This game will be a huge challenge for India, but we hope that the team can at least put in a stronger effort than yesterday and surprise a few people. Thank you for joining us! 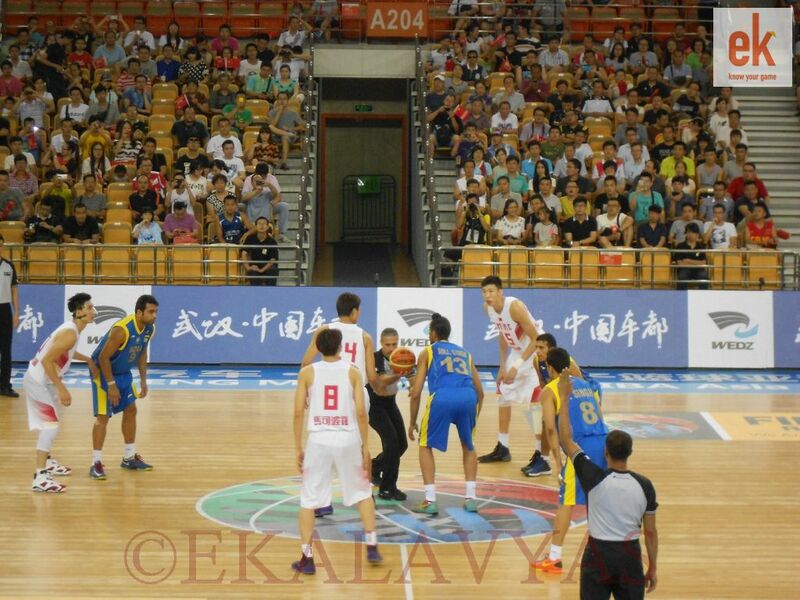 Our columnist Karan Madhok is in Wuhan, China and will begin the live updates tomorrow before scheduled tip off. Thanks Guys for play-by-play commentary, specially when the game isn’t been telecasted here in India. Appreciated! DAMN! I didn’t know we were that CLUTCH !!! Being associated with basketball closely..it gives me immense pleasure after hearing this…..congratulations! Proud to be an Indian, Great show by our boys. Well done Indian team players, coaches and team followers. WELL done to the india team .. My brother is part of this team..
Oh man. Seeing live commentary for the first time in Indian Basketball. Really appreciate it. Waiting for the day when main stream media would take basketball seriously. I’m a filipino and I get goosebumps watching this. I always root for the underdog. More success for your basketball team in the future. I can see that this team can be one of the better teams in asia. as i love playing basketball too..
My joy knew no bounds when I hear this news…but no big coverage in the media..watched the entire recorded game..I have played almost full time twice against China..both the occassions beaten solidly by them..yet I believed that we can match them..this team has DONE it..kudos to the Coach and the players..and to you for the good coverage…Jai Hind..
Line two ‘no big coverage’ not ‘so big coverage’..sorry for the typing error..
No issues Sir. We have made the correction 🙂 Keep commenting on all our articles!